How many of you know exactly what it means to have the Holy Spirit dwelling in you? From my experience talking to people, most people are rather unsure of how the Holy Spirit dwells in us, and what does the Spirit do. Most people think that there’s a lot of mystery surrounding it. But there’s not. The bible tells us exactly how the Spirit dwells in us. What are some characteristics of “team spirit”? Those definitions give us three characteristics.. Camaraderie, cooperation, and loyalty in thought and action. But we might add to that, things like sacrificing for team member, or helping to bear the load for a team member. Have you ever heard of “The Spirit of 76”? The Spirit of 76, refers back to the Revolutionary War. It refers specifically to the attitude and a purpose that motivated people. It’s an attitude of of self-determination, and individual liberty, that is exemplified in the Declaration of Independence. So we understand what it means to possess a particular type of spirit. Whether it’s the spirit of individual freedom, or team spirit, it’s a matter of possessing certain characteristics, and acting in accordance to them. But now let’s talk about what it means to have the Holy Spirit dwelling within us. 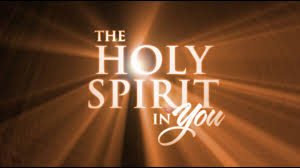 In last Sunday night’s, lesson on the “Gift of the Holy Spirit”, I mentioned that sometimes the bible says, that the Holy Spirit dwells in us, and sometimes it says that the Spirit of Christ dwells in us, and sometimes it says that the Spirit of God dwells in us. Galatians 4:6 says; “And because you are sons, God has sent forth the Spirit of His Son, into our hearts, crying Abba! Father!” Romans 5:5 says; “And hope does not disappoint, because the love of God has been poured out within our hearts, through the Holy Spirit, the one given to us.” So there’s the “Holy Spirit”, being used interchangeably with the “Spirit of His Son”, which of course is the “Spirit of Christ”, which also is the “Spirit of God”. The point is that one doesn’t dwell in us without the others! The Holy Spirit is not a “separate entity” that dwells in us. When I say that the Holy Spirit is not a “separate entity”, that dwells in us, I’m not drawing my own conclusion, and I’m not speaking my own opinion, I am simply re-stating, and believing what the bible has already said. If I were to say that the Holy Spirit IS a separate entity, I would be contradicting the scripture that I just shared with you. It’s the Spirit of GOD that must dwell in us. And that Spirit of GOD, is God’s “holy” Spirit, which is also the Spirit of Christ. The “Spirit of God”, Romans 8:9, the “Spirit of Christ”, Romans 8:9, “His Spirit”, verse 11, the “Spirit of His Son”, Galatians 4:6, and the “Holy Spirit”, Romans 5:5. That is what must dwells in us, if we are living as Christians should live. There’s something that we should be aware of, when considering the Holy Spirit. The word “holy” isn’t a proper name for the Spirit of God. But rather, it’s a description of the Spirit of God. The Spirit of God, is a “holy” Spirit. To be “holy” means to be different from the world. Not only is the Spirit of God “holy”, but GOD is “holy”. Here’s the word of God, from 1 Peter 1:16; “..You shall be holy, for I am holy.” So God is “holy”, and His Spirit is “holy”, and He wants us to be “holy”. Verses 14 & 15, of 1 Peter 1, tell us HOW to be “holy”. It says; “As obedient children, (that’s how we do it, “as obedient children”) do not be conformed to the former lusts which were yours in your ignorance. But like the holy ONE who called you, be holy yourselves also, in all your behavior.” In order for us to be “holy”, as God is “holy”, we need to be obedient children, in all our behavior. And we need to NOT be conformed to our former lusts. That’s how you live when you’re ignorant of God’s word. So, be obedient, and do not be conformed to the former lusts which were yours, in your ignorance. It should be obvious, but, if we are to NOT be conformed to this world, what are we to conformed to? We are to be conformed to God’s will. Romans 12:2 told us to “prove what the will of God is.” The word “prove” in this verse, means.. “to examine, and scrutinize, and to test by trying”. So then we closely examine God’s word, and we put it to the test by LIVING the word. We become “holy” as He is “holy”, when we live according to the word of God, and conform to His will. Are you seeing how the Spirit of God dwells in us? The Spirit of God is “holy”. And if we would have the Spirit of God dwell in US, then WE must be “holy”. And if we would be “holy”, we must be “like the holy One who called us”, by obeying everything that He tells us to do. I’ve repeated it several times already, but It’s really as simple as that. Jesus said in John 6:63; “The words that I have spoken to you are Spirit and are life.” The very words of Jesus, and of God, are Spirit. But of course, just knowing the words, doesn’t mean that the Spirit dwells in us. But “living” the words of God DOES mean that the Spirit is dwelling in us. If the Spirit dwells in someone, there is evidence of that indwelling of the Spirit. And the bible calls that evidence, “the fruit of the Spirit”. According to Galatians 5:22 & 23, when the Spirit dwells in you, you will exhibit “Love, and joy, and peace, and patience, and kindness, and goodness, and gentleness, and self-control”. The indwelling of the Spirit of God in us, is what makes us “holy”. It makes us different from the world. And that indwelling of the Spirit, is what produces the “fruit of the Spirit”. Can you see why it is NOT God, who actually puts His Spirit in our hearts? It’s up to US to put that Spirit in our hearts. It’s US that has to make the choice to live according to the way God has told us to live. God has revealed His Spirit to us, through His word. But it’s up to us to make the decision to live according to what’s been revealed to us. God “gives us” His Spirit by revealing it to us, through His word. And when we OBEY the words of God, THEN we have God’s holy Spirit dwelling in us. The Spirit that we put in our hearts comes from God. That’s why it says, in 2 Corinthians 1:21 & 22; “Now He who establishes us with you in Christ, and anoints us, is God, who also sealed us, and GAVE us the Spirit, within our hearts, as a pledge.” Another word for “pledge” is a “down payment”. The Spirit that is within our hearts, came from God. And that Spirit within us, serves as a “down payment” towards the promise of eternal life, which is made to us, when we are baptized for the forgiveness of our sins. 2 Corinthians 5:5 talks about the down payment like this; “Now He who prepared us for this purpose is God, who gave to us the Spirit, as a pledge.” We don’t possess eternal life yet, while we live in this life, but we have the promise of eternal life IN HEAVEN, when this life is over, and when the resurrection day comes. And the “pledge”, or in other words, “the down payment” towards that eternal life, is the Spirit of God, which dwells in our hearts. Having the Spirit within us, really serves a dual purpose. The Spirit serves as “the down payment” made towards our eternal inheritance, but it also serves as “a seal” or in other words, as a “mark of ownership” by God. 1 Peter 2:9 says that we are “a people for God’s own possession”. But it all hinges on whether or not WE will PUT the Spirit of God within our hearts, by obeying His word, as it is revealed in the bible. Would you be “holy” like God is “holy”? Would you have the Spirit of God dwell within you, so that you can be marked as His very own possession, and have the promise of eternal life in heaven? Then as an obedient child, you must hear His word, and have faith in it, Romans 10:17. You must repent of your sins. God is now declaring that all men everywhere should repent. Acts 17:30. You must confess your faith in the name of Christ, just like we’re told in Mathew 10:32. And you must be buried with Him in baptism for the forgiveness of your sins, just like we’re told in Acts 2:38, and Romans 6:4. Then you can live a “holy” life, with you in Christ, and the Spirit of Christ in you. ← How Does God Give Life To Your Mortal Body ? Thank you so much for explaining how the holy spirit comes to dwell in Christians and backing it up with scripture. Have been told that it is through the word but not how. Thanks for helping me understand. Thank you for reading the article. I hope that you will read other articles as well, to learn more of God’s word. Do you still have questions about the Holy Spirit, or any other bible subject? I would be happy to study with you. Thanks again, and God bless.